Google Chrome blocks Flash content by default in recent versions of the web browser. Google furthermore removed controls from Chrome in regards to plugins and Flash, and will remove Flash support from the browser in the coming years as Adobe announced the retirement of Flash by the year 2020. Google Chrome's current behavior when it comes to Flash is to block the execution, and prompt users whenever Flash content is encountered. The browser prioritizes HTML5 content when it is available over Flash content. While this works at times, it does not at others. The prompt may not be displayed and users are without controls then to enforce the running of Flash in the browser. Google integrated Adobe Flash natively in Chrome back in 2010, and it has been part of the browser ever since. Flash content is not allowed to run by default in Google Chrome. Sites may display notifications about that on their pages, like "click to enable Flash Player" or just a button to enable Flash. You can click on this, and then on the "run Flash" prompt that the browser displays near the top of the interface to run the content that time. The Flash content is loaded in the browser if you select allow, and not loaded if you dismiss the prompt or select block instead. The notification that is displayed instead of the Flash content is not displayed all the time. You may also need to click on the "get Adobe Flash" button instead, or may find yourself in a situation where you cannot activate Flash at all. 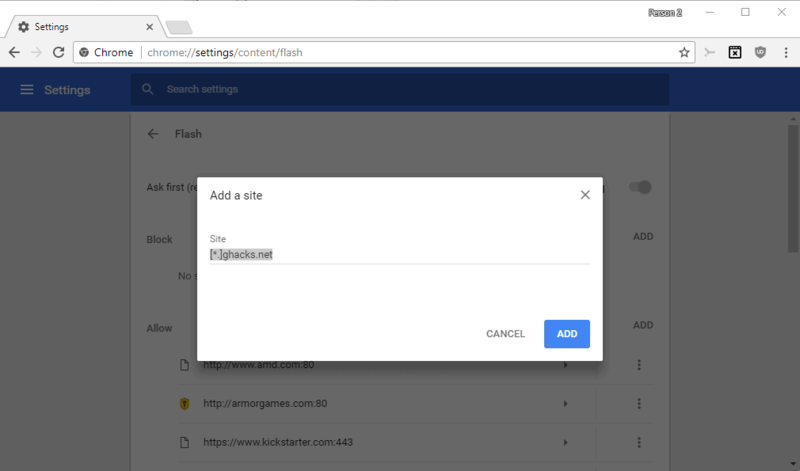 While you can allow sites to run Flash when Google prompts you to do so while visiting a site with Flash content, you may want to allow Flash on some sites permanently to make things easier. The latter may also be important for sites that don't work properly in regards to allowing Flash content, for instance when Chrome does not display the prompt. Load chrome://settings/content/flash in the browser's address bar. This opens the Adobe Flash content settings. You can change the status of Flash by moving the "ask first" slider to off. To add a site to the allow list, click on the "add" button next to allow, and add a site to the list. You can use [*. ]example.com for that, or enter https://www.example.com/ instead. The same rules apply to sites that you want to block from running Flash content. A click on the three dots next to a site listing gives you options to edit, remove or block sites (allow if you click on the three dots next to a blocked site). Now You: do you visit sites regularly that require Flash? The tutorial explains how to enable Adobe Flash on sites in the Google Chrome browser, and how to do so directly in the browser's settings. repeat the test several times. 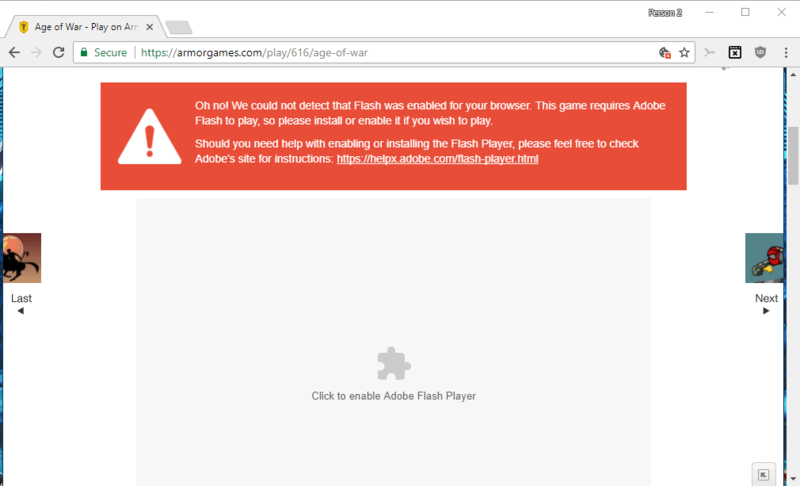 If a site requires flash, I move on. The *ell with flash. Let this mofo die, don’t allow it, don’t install it and don’t touch it. Yes I prefer flash to HTML5. Its just most controllable than HTML5. HTML5 n many browsers is harder to control, harder to block, harder to manipulate than flash with the multitude of tools that have been made available for it. In recent times flash hasnt been all that unstable either. The major frustration that came with using flash was when it crashed the whole browser went down taking with it inumerable other things. In modern times though sessioning has made that at most a minor inconvenience. If they start adding controls to browsers that allow manipulation of HTML5 that is equivalent to flash, no problem. Until then many people will keep the devil they know. HTML5 or canvas also have DRM, Google for more details. HTML5 or canvas also can get High CPU usage, Google for more details. It’s horrible to maintain because it’s closed source? Strange dependencies? I really don’t understand this sentence. Many popular frameworks are also closed source, .NET Framework and Unity are closed source for example. As a developer, I would be lucky to score just a c+ then a c++ so, I am not a programmer. But as far as the eye test…With respect to CHEF, I would have to agree with joji. Flash is in constant need, changing of its underwear for reasons of security and that is bothersome, and I prefer HTML5 but in addition, I also have the need to choose from time and place to approve flash during my session. This has always worked best for me. You are definitely not a developer. Flash was much, much easier to program than JS (with so many open standards and browsers at the same time…) and it also was faster, including trivial video playback. I wander what website still uses Flash. Only fool ad iframes. Can you make it work on newsmap.jp, Martin? @Martin what’s extension on first screenshot between WebRTC Network Limiter and uBlock Origin? Thanks for this link! That’s it! There is an easier way with chrome which i use. I use flash on one escape game site and all i needed to do was click the security padlock in chromes omnibar and allow flash in the drop-down menu. Can tech help sites stop lying to their visitors or at least update the damn information so that you aren’t lying by accident?